This past week our yard has been inundated with birds. Many of our summer residents such as Robins, Mourning Doves, Flickers, Pine Siskins, Purple Finches and Gold Finches are still here. Hairy Woodpeckers, Downy Woodpeckers and House Sparrows, our permanent residents, have finished raising their young and are visiting our feeders. The real population explosion is in the arrival of the transients. Here is a list of the ones that we have seen in our yard so far: White Crowned Sparrows, White Throated Sparrows, Lincolns Sparrows, Harris Sparrows, Tennessee Warblers, Orange Crowned Warblers, Wilsons Warblers, Least Flycatchers, Philadelphia Vireos, Rose Breasted Grosbeaks and Ruby Crowned Kinglets. There are more to come. Since these birds are in our yard they are in everybody else's as well. For those wanting the names of birds to look for this list should be a good start. Since hunting season is upon us I decided to cover a game bird that used to be a hunting staple in times past but not so much now - the Ruffed Grouse. Like all members of the chicken family the males and females are different but only slightly, and at a cursory glance they look the same. (Think of barnyard turkeys at any distance). The most obvious differences occur during mating season when the males start "strutting their stuff". Unlike most birds, the young develop wing feathers first and after only a few weeks are capable of short flights. (For us old-timers recall the development of chicks on the farm). When danger approaches the hen and chicks fly off in all directions confusing a would be predator. As implied, the males do not take part in raising the young. Most members of the chicken family are coloured in earth tones thus providing good camouflage. All males of the chicken family put on an attention grabbing display - some quite spectacular. The male Ruffed Grouse picks a high spot in the forest such as a fallen tree, stump, rock or abandoned ant hill as his display stage. Here he fans his tail feathers like a turkey, fluffs out his neck feathers or ruffs (hence the name Ruffed Grouse), raises his crest, drops his wings along his sides and then proceeds to beat his wings in a dull thumping or drumming sound. The beats start out slowly and then speed up ending in a crescendo. As a youngster on the farm I thought for the longest time that it was one of our neighbours starting up his two cylinder John Deere tractor. In the country school that I attended, the ash pile from the coal furnace served as the stage from which the male would drum. Many times I would stand in the window and just watch him. It was quite a performance and I never tired of it. 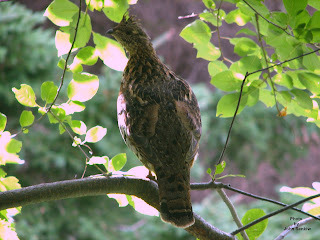 Ruffed Grouse are birds of broad leaf woodlands whose populations have been reduced because of agricultural activities. This loss of habitat coupled with an approximate seven year population cycle has at times made the bird very scarce. For those living on farms with larger tracts of poplar forest nearby listen for the drumming. Drumming activity occurs twice a year - the mating displays in the spring and the young males practising in the fall.